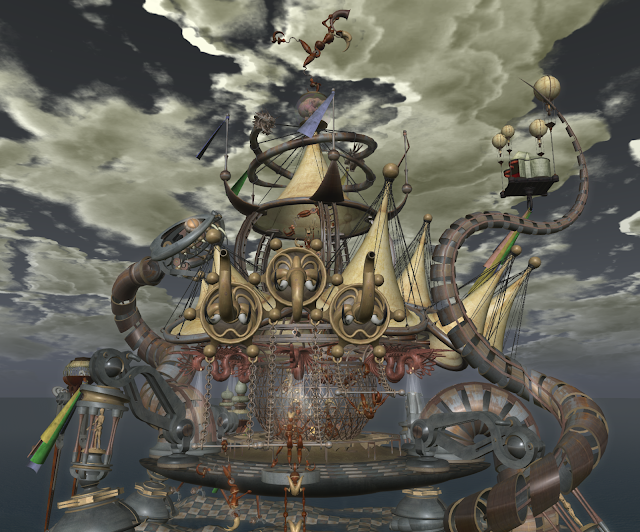 For several months, artist Yooma Mayo has been building Mechanical Circus at LEA24 (one of the Linden Endowment for the Arts sims), and finally it's finished. Officially opening today, Thursday, July 25, it's just in time, as the exhibition must end on July 31, so we have only a few days to enjoy this remarkable and glorious build. Those who visited Yooma's installation at La Città Perduta earlier this year may notice a few motivic similarities—elephants, acrobats and the like. The structure itself is immense, and you won't be able to see all of it unless you turn your draw distance up—the build rises nearly 300 meters up into the air and stretches hundreds of meters across the sim. The number of objects in the artwork—and their level of detail and interconnectedness—is staggering, as is the sheer inventiveness of these half-animal half-machine circus performers. Mechanical Circus is not to be missed. Awesome. Your clouds are incredible also. Thanks, Charolotte. :) The clouds are the Cumulo-Nimbus clouds available on Firestorm and some other viewers ... the top windlight setting is Places Annamaria, which for some reason always works well with Yooma's creations, and the second two are the region default windlight.